We have Felix safely back in our arms and it's the best feeling ever! 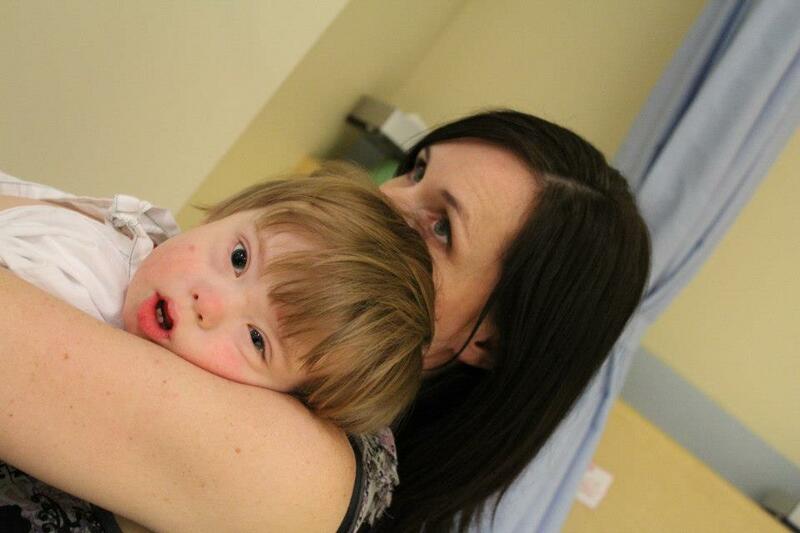 I know what we have gone through over the past couple of days is nothing compared to what a lot of parents, of kids with Down Syndrome (and others), have to go through. I have immense admiration for those parents; for their courage and their strength. 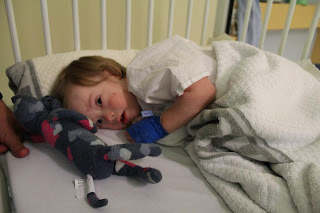 Even with something as straightforward as Felix's surgery, it is never easy to hand over your precious child to a stranger and trust them to look after them and not make a mistake. I can't imagine going through anything more serious with him. Monday morning started bright and early. 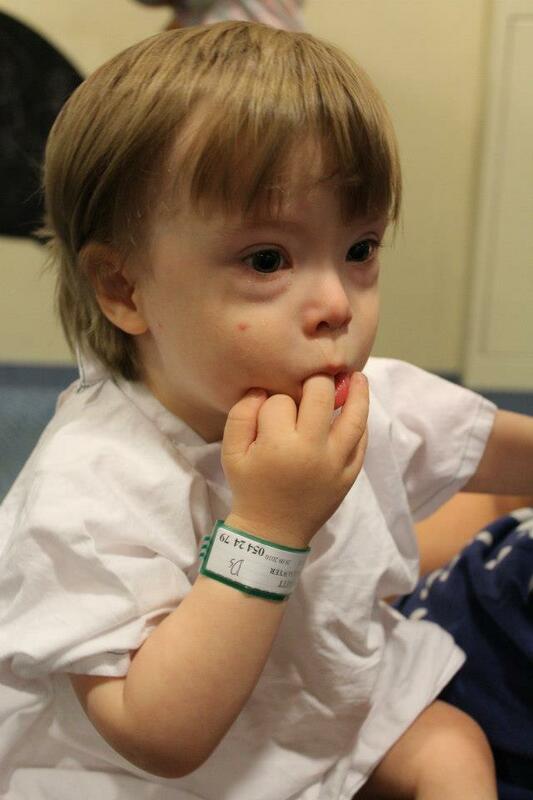 We had to have Felix at the hospital at 7am to check in. Felix loves his breakfast, and usually eats a lot of it, so he wasn't too impressed about the whole fasting thing. He kept signing 'eat' and we had to keep distracting him with something else. I'm sure he thought we were ignoring him. Thankfully, he was first on the surgeon's list, so was all dressed in his white gown and ready to go at 9am. We decided that Nathan would go in with him while he was put to sleep this time, because I did it last time. He got all dressed up in his blue scrubs, hat (yes...even on his bald head) and booties. Felix didn't like the look of his Daddy dressed like that and didn't even want to be held by him for a while but, eventually he was snuggled up on his shoulder ready to go. Nathan said Felix did well and went straight to sleep. They told us to expect him in recovery in about 40 minutes. 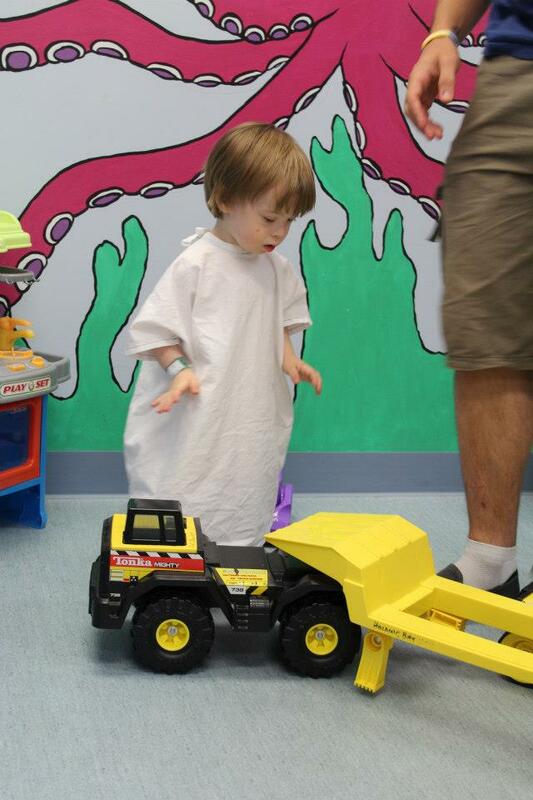 The usual time for grommets is only 20 minutes, but he had to have his tear duct probed and flushed as well which added to the time. 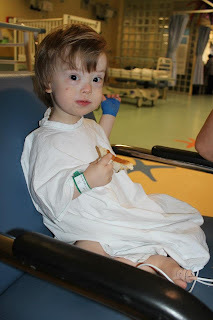 Sitting and waiting makes the time go even slower when your child is in surgery. All the other kids, who had grommets, were back within 20 minutes of going in, and were having cuddles with their parents and we were still waiting. When the 40 minutes passed, and it became an hour, I started to get restless. Thankfully, after an hour and a quarter, our little guy was back; a little groggy and looking a bit frightened, but safe and well. Those next cuddles were the best ones I'd had in a long time. Felix dozed for about an hour and a half, and only woke up when I tried to lay him on the bed because my arm had gone to sleep. He didn't seem to be in any pain, but was a little bit annoyed about the drip, which was still in his arm, and the heart rate monitor still stuck to his big toe. He woke up with a ravenous appetite and wolfed down an entire tub of yoghurt and a vegemite sandwich. The nurse brought him some juice in a baby bottle. It looked so funny seeing him drink it out of there because he never had a bottle, even as a little baby. He didn't care. He was so thirsty, I think he would have had a drink out of anything. After he ate, he had a little bit of a walk around. He looked a bit drunk and wobbly from the anaesthetic, but he found his land legs after a few minutes and happily walked around. 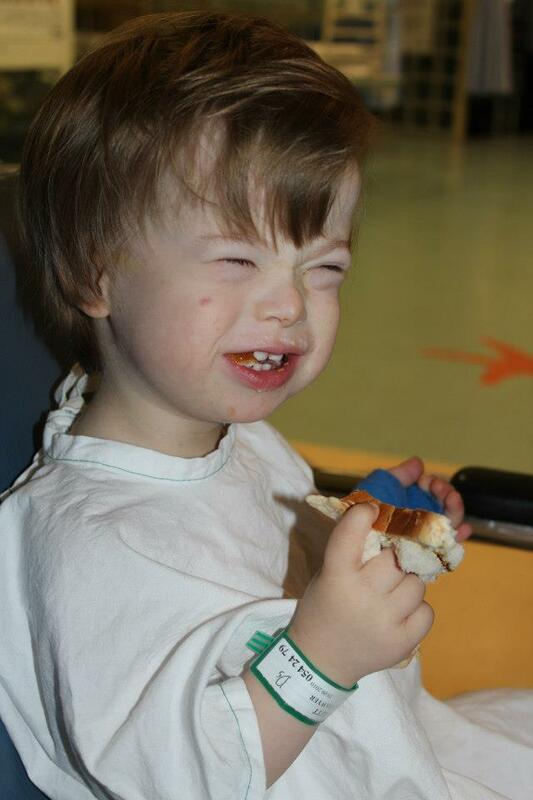 The nurse told us that the surgeon had some trouble getting the grommets into Felix's ears. His ear canals are a bit narrow, but they are also at a different angle to most other childrens, so it was a bit problematic. We're not sure what that means, and whether they may not stay in his ears properly, but I guess time will tell. Apparently his right eardrum had a lot of gross stuff behind it so I'm glad they were able to get in there and clean it all out. His ears smell beautiful at the moment. We didn't get to speak to the Opthamologist about what they found when they looked at Felix's eyes, or how the probe went. We will be having a follow up appointment with her in about 6 weeks. Felix woke up with really gunky eyes this morning, and his 'good' eye was worse than I've seen it in over 12 months. I'm hoping that it's just as a result of the surgery. Hopefully they will look better in a few days. A crazy face...he must be better! 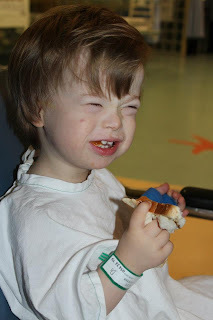 After Felix was able to be discharged from the hospital, we went back to our hotel where we had visits from some of our family. Felix loved having them all there, even though he was still a little bit sleepy. We all had dinner together, which was really nice, and then Nate, Felix and I all had an early night. Felix pretty much asked to go to bed and, even though he was in the same room as us, went straight to sleep. We're now home, after our long drive. Felix was pleased to see his brothers and to be able to play for a while. He has been really happy all day, which we're thankful for. He doesn't seem to have had any pain or discomfort from his ears, so hopefully he'll sleep peacefully again tonight. Thank you. Hopefully the grommets will stay put so we don't have to do it all again!